The SV-1 is my latest acquisition. I bought it at auction from a load of music and sound equipment that was recovered from one of the music shops after the Feb 22 earthquake. Like most of the gear, it was damaged, and in this case the top 8 keys were broken. Having checked that it actually worked I decided to bid on it. The worst case scenario would be that it would be an 80 note keyboard, which is 4 more than the 76 note version, so I had little to loose. I also figured out that shortening the keyboard back to the E note of the top octave was a real possibility. When I dis-assembled it I was pleasantly surprised to find that although the damaged keys had sheared pivots, the actual weighted mechanism was fine. All the broken bits of plastic and the key springs were still rattling around inside the case. This meant that repair was just a gluing job. Then I came across a very useful document: Design guide for Bonding Plastics, by Loctite. Each plastic type is listed with full technical specifications, and the shear strength for various Loctite products when applied to them. The winners for Styrene Acrylonitrile are Loctite 401, and 404. Looking up the separate spec. sheet for these reveals that they are both Ethyl Cyanoacrylate based, and this is the active stuff in Superglue. I have had mixed results with Superglue bonding plastic in the past. Where the Selleys product differs is that a Primer is applied before the glue. I did a test on one key first, cleaning the faces with IPA, then applying primer to both, glue to one, then clamping the two parts for 30s. This was then left for 30 mins and I could twist the join without it parting. So...I now have all 88 notes working. Without more information on the Selleys product (and none is released yet) there is still some guesswork as to whether the bonds will hold with key movement over time, or if I would have been better using a 2 pot epoxy. As all the affected keys are at the top extremity of the keyboard they won't get much use, so here's hoping. The word plastic is a generic term (like 'food' or 'animal') and the fact is that plastic technology is a very complex subject. Plastics Design Library publish a reference book called "Handbook of Plastics Joining". It runs to over 500 pages (and costs several hundreds of dollars). Rather than reading that, I'm off to play the SV-1. 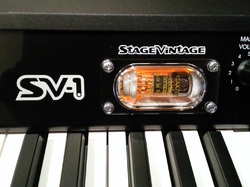 The SV-1 sounds are all from well known keyboards as well as a few other sorts. There are Yamaha and Steinway grand pianos, CP70 electric piano, Hohner Pianet, Wurlitzer EP200, Rhodes MkI, Yamaha DX7,Hohner Clavinet D6, RMI Electrapiano. There are also strings sounds - real strings (small and large ensembles), Solina strings, Mellotron 400 strings. Then there are the organs - various settings of Hammond B3, as well as a Farfisa, and Vox Continental. In the handbook the actual instruments are not named but someone has done it on this French website. The FX are also named. There are two additional Soundpacks that have been released and are available free from the Korg website. The SV-1 is very playable. It behaves like a real keyboard, rather than a plastic synth. The EP sounds are really good. So are the strings, and the pianos. The original Clav sounds were lacking but they are much better in the Soundpack 2. More attention has been paid to the Hammond sounds here too, but really this is a piano / EP with some very usable organ sounds. Don't sell your B3 just yet, though. Even without a valve, the front-panel of the SV-1 would still be very cool. To warm things up there is a 12AX7 (ECC83) dual triode which is run as a pseudo complimentary output stage into a dummy loudspeaker. High and low bias settings are automatically switched to suit the various amplifiers being modelled, giving class A or Class AB operation. And, if you are wondering, no it is not possible to change the valve from the front panel (which would have been good, as a valve with a bit less gain would soften the distortion). The SV-1 is not lacking FX. 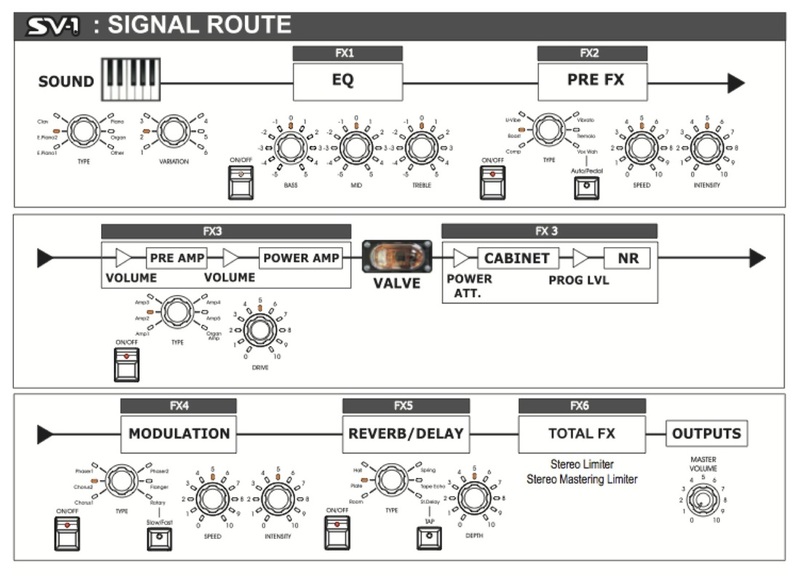 There is EQ (not parametric, but the mid ƒ can be adjusted using the software), Compression, Treble Boost, Univibe, Tremolo, Vibrato, Wah, amp modelling with Drive (gain control), Chorus, Phaser, Flanger, Leslie, Reverbs, and delays (what, no ring modulation?). Image that, a keyboard that doesn't need stomp-boxes! Maybe that's why it has audio inputs - so the guitarist can plug in if he's forgotten to bring his rig to the rehearsal. The service manual can be downloaded here.